Hello, i have little question. How is it possible to set keyboard map on Wayland ? I search but i don't found anything. Is there same program as setxkbmap for Wayland ? that depends on the Wayland compositor you use. Which one do you use? I don't understand what is exactly compositor, but i would like to use sway (i3 for wayland). And i have second question, is it possible to use lightdm to start wayland session ? uhm, I do not know. 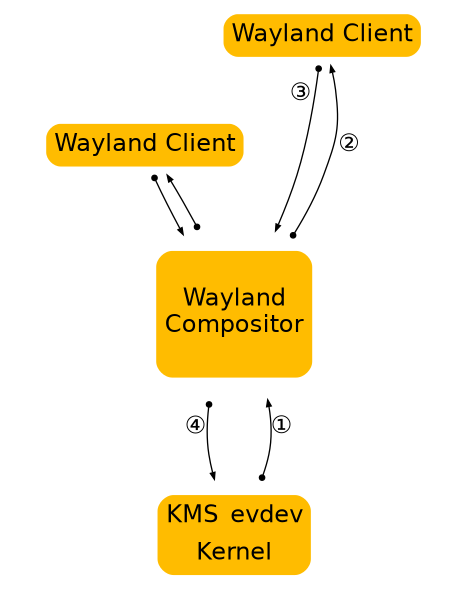 I believe the compositor controls the whole composition made by all Wayland clients like a conductor (music). A window manager may be launched from command line so LightDM may probably start it. Anyway, the administrator must perform some configuration (read "note") to enable the system. Okay thanks, and how i configure status bar with sway, for example set date format or add item? And i have other question. Wayland is now mature or it isn't ready to use ? Recommend or not ? Wayland is pretty minimal in its design. It leaves most of the heavy lifting to others, eg. Gnome, KDE or in this case Sway. Arguably Gnome Wayland has been quite usable for some time now although all the Wayland compositors have their own problems and insufficiencies (which are ever so slowly being resolved/fixed). As for Sway, it is currently being ported to use wlroots instead of wlc as its backend Wayland compositor library. This will fix many of its longstanding problems, eg. display output rotation. See the latest 1.0 alpha release for info.